I am all about bringing the holiday into everything that I can! (which is why every sandwich I make this time of year is cut with a cookie cutter into some Christmas shape!) 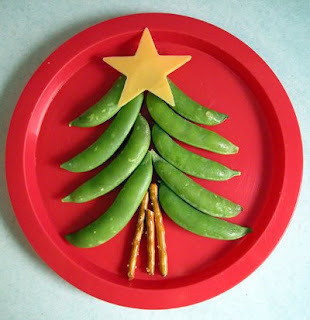 Little Nummies has a ton of cute ideas for holiday snacks for kids, but this one is my favorite! Now this is one that even I can do! That is too darn cute! And my kids love peas. this looks so good to eat right now! That is adorable! Of course, my son still wouldn't eat it. Cheese. Peas. Bread products. Yeah ... no way.